You can support LSMSA in many ways. Whether it's recommending LSMSA to others, supporting and attending an event, giving financially or volunteering your time, you will have an impact on LSMSA in ways that may exceed your expectations. Your gift can be automatically drawn from your account and sent to the LSMSA Foundation. Your employer may double or even triple your gift to LSMSA! Donating stock to the LSMSA Foundation is easy. Planned gifts have an enormous and lasting impact on LSMSA. Make supporting LSMSA a simple, everyday event as you shop, browse, or enjoy a cup of coffee. You can donate your time or professional expertise to help LSMSA. LSMSA is currently not eligible for the Box Tops for Education Program. Have a specific interest? Contact Angela Robinson at arobinson@lsmsa.edu or call 318-357-2552. Wondering how much to give? The Charitable Planning Calculator uses your annual income and national averages to help you plan your contribution. Now you can show your support for LSMSA every time you get in the car! 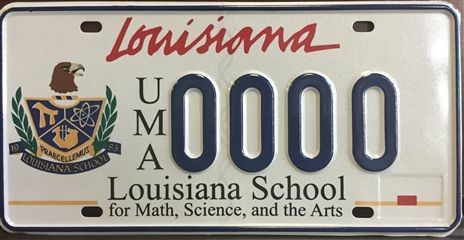 The LSMSA license plate is available for vehicles registered in Louisiana. A portion of each registration goes directly back to LSMSA. Visit the Department of Public Safety website to order your LSMSA tag today!